Overcast with the brisk easterly breeze remaining on the 29th saw a few new arrivals on the isle with a male Lapland Bunting near the Obs the highlight along with a range of other typical March landbird migrants including 119 Meadow Pipits, 31 Pied Wagtails, 41 Blackbirds, 2 Goldcrests, 4 Snow Buntings and single Dunnock, Song Thrush, Mistle Thrush, Wheatear and Chiffchaff while 78 Linnets feeding in Kirbest crop was a big increase. The regular ringtail Hen Harrier and young male Merlin were still cruising around chasing things. The light easterlies continued into the 30th which, when combined with slightly warmer temperatures is a sure fire recipe for fog which proved to be the case with mist and murk first thing slowly clearing to produce a beautiful day before coming back in mid-afternoon. These constantly changing conditions brought a few new birds in with 2 Black Redstarts at the north end, 5 Woodpigeons, 18 Rock Pipits, 47 Blackbirds, 18 Redwings (including some dark, long winged Icelandic coburni birds) and single Mistle Thrush, Goldcrest, Wheatear, Chiffchaff and Snow Bunting recorded. There were some good wildfowl counts made through the day including the single Pink-footed Goose with 770 Greylags, 9 Shelduck, 168 Wigeon, 7 Gadwall, 74 Teal, 8 Pintail, 9 Shoveler, 24 Tufted Ducks and a single lingering Goldeneye. Also of note was a significant count of 320 Purple Sandpipers with big flocks feeding at high tide at Brides and Bewan while other waders included 178 Golden Plover and 183 Turnstone. Light northerly winds on the 27th moved slowly round to the east giving us a sense of anticipation for the week ahead and it started well with the first 2 Wheatears of the year seen at the top end of the island – a pretty decent earlyish arrival date for us; other landbirds through the day included a good influx of 151+ Meadow Pipits, a Dunnock, 13 Redwings, 6 Goldcrests, a Rook and 15 Snow Buntings. One Pink-footed Goose remained with the 708 Greylags counted while other little bits of note comprised 12 Red-breasted Mergansers, a ringtail Hen Harrier and single Water Rail, Jack Snipe and Black-tailed Godwit with the long-staying 2nd winter Glaucous Gull still present. It was straight easterly the next day so it was no surprise that there were some additions to the year list with pride of place going to a Hawfinch which dropped in briefly to Holland in the afternoon while the single Brambling and Chiffchaff that were there in the morning were also new for the year as was a male White Wagtail near Gretchen. Other counts included 29 Pied Wagtails, 22 Redwings, 2 Mistle Thrushes, 5 Goldcrests and a littoralis Rock Pipit while the Glaucous Gull again mooched around the top end. 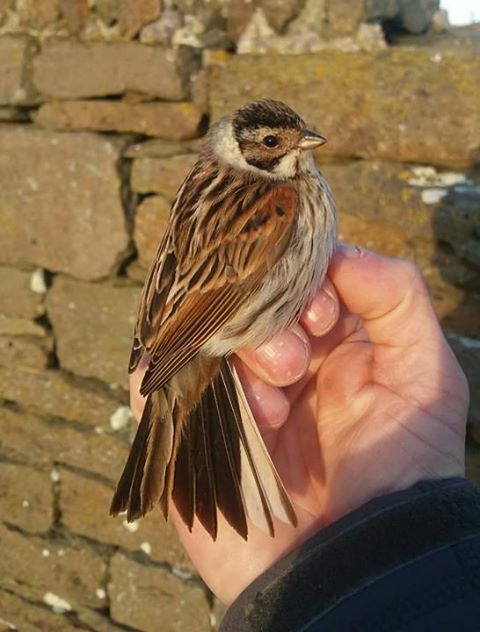 Breezy and overcast on the 25th with limited new arrivals although 65 Linnets and 20 Snow Buntings were new high counts for the spring while other landbirds included 5 Redwings and 2 Woodpigeons still at Holland. Some decent wader totals for the day included 290 Golden Plover, 211 Oystercatchers, 49 Sanderling and 36 Bar-tailed Godwits along with a single Black-tailed Godwit. Three Whooper Swans were new at the north end while a Merlin was busy chasing Skylarks at the south. The weather changed for the 26th with early morning mist and murk lingering due to very light winds; the tentative opening of a handful of nets at Holland first thing almost immediately was rewarded with the capture of 2 awesome Long-eared Owls while a Woodcock was also flushed out of the garden. There were more landbird arrivals through the day including the first Goldcrest and Sparrowhawk of the spring along with 2 new Stonechats, a Chaffinch, 34 Snow Buntings, 63 Meadow Pipits and 34 Pied Wagtails. Calm seas also allowed counts of 21 Great-northern Divers and 8 Red-throated Divers while the 2 Pink-footed Geese were still with 515 Greylag Geese. Two other birds to mention comprised the surprise reappearance of the Northern Harrier (well, a slight raising of the eyebrows perhaps! ), he must disappear off island for spells but who knows where (?!) and an interesting duck on the sea off Brides which was presumably a drake Eurasian Wigeon x American Wigeon hybrid. Despite the chilly northerly wind it was a glorious, sunny day on the 23rd so the nets at Holland were opened first thing for the first time in a while but it was still quiet producing only single Reed Bunting and Linnet; the rest of the day followed a similar theme with just a Sandwich Tern in Nouster, a Grey Plover and 4 Snow Buntings of note – but it was a lovely day to be out and about! A different day on the 24th with breezy and overcast conditions produced a few new bits and pieces with the first Rook of the year flying past the Obs, a single Black-tailed Godwit and an increased 18 Snow Buntings including 17 on The Links and a corking summer plumaged male at the lighthouse. Other counts included 8 Great-northern Divers, an extra couple of Mute Swan pairs back on territory, 2 Pink-footed Geese with 638 Greylag Geese and 251 Golden Plover while single Hen Harrier and Merlin still floated and dashed around respectively. It’s now five days since the Northern Harrier has been seen – perhaps he has moved on for the summer? A much nicer day on the 21st with only a few showers to keep us on our toes; a Grey Wagtail was near Hooking along with notable increased counts of 36 Meadow Pipits and 13 Pied Wagtails while single Stonechat and Song Thrush completed the Passerine highlights. 6 Whooper Swans were new and included a 1st winter bird as was a smart adult male Merlin which came in off the sea at the pier. Other birds of note included good counts of 53 Sanderling and 244 Purple Sandpipers while the 2nd winter Glaucous Gull still floated around and on the sea totals of 11 Red-throated Divers and 9 Great-northern Divers were seen on much calmer seas. Apart from the morning hail showers and the bitingly cold northerly wind it was a lovely sunny day on the 22nd but the cold weather limited notable records to just the regular drake Smew on Bewan as well as 9 Snow Buntings also on the north coast. There were no Northern Harrier sightings over these two days but experience tells us he can easily turn up again after disappearing for a few days. The weather reverted back to the unpleasant, blazing strong, cold winds of a few days ago but that didn’t stop the first Sandwich Tern of the year turning up off The Links on the 19th; the Northern Harrier and drake Smew were also still present along with single Hen Harrier, Merlin and Peregrine. The lingering juvenile Glaucous Gull was still present along with decent counts of 255 Golden Plover, 48 Sanderling and 278 Turnstone while passerines were again limited to just the 3 Woodpigeons, single Stonechat and 7 Snow Buntings. The 20th was almost a write off with very strong winds in the morning turning into extremely strong winds in the afternoon, all the while with vicious rain / hail squalls whipping through with the only birds of note comprising the Glaucous Gull again, 5 Snow Buntings and a slight increase to 26 Linnets. A greatly improving picture weather-wise with winds easing down and the sun poking out but no one really told the migrants as a Lapland Bunting near Gretchen hide was pretty much the only new arrival through the 17th while the Northern Harrier still floated around along with single Peregrine and Merlin and the drake Smew held out on Bewan. At least 12 Linnets came into roost at Holland while 5+ Pied Wagtails were on the island indicating slight increases in these common breeding migrants as the ‘spring’ crawls ahead. It was as if we regressed back several weeks on the 18th with all the highlights being long staying and wintering birds as both the drake Green-winged Teal on Gretchen and the Black-throated Diver in Nouster reappeared, the Northern Harrier became visiting birder Cliff Davies's 500th UK species, a single Pink-footed Goose remained with 850 Greylag Geese and the drake Smew was present again with 7 Goldeneye and [a slightly increased] 11 Red-breasted Mergansers while a single Glaucous Gull and 9 Snow Buntings were also seen. Despite the wintery feel to the birds recorded it was largely a glorious, sunny, [relatively] warm day and the breeding birds that have made it here made the most of it with singing and nest-building Wrens, drumming Snipe and parachuting Meadow Pipits all in action. The cold, very strong, relentless westerly winds still battered the island over these two days so new arrivals were limited and still of a wintery nature on the 15th with raptors to the fore as the Northern Harrier was cruising around accompanied by a ringtail Hen Harrier, 2 new Peregrines (an adult male and an immature male) and the young male Merlin. There was a new darkish juvenile Iceland Gull in the north along with 2 Glaucous Gulls while wader counts included 258 Oystercatchers, 36 Sanderling and 154 Purple Sandpipers. Landbirds were very limited including just the 3 Woodpigeons, 4 Robins, a Fieldfare and 3 Snow Buntings. The weather was even worse on the 16th – a blasting force 8/9 westerly wind with hail/rain showers whipping through so even though the first Black Redstart of the year had been expected for a while now, the fine male at Garso certainly picked the trickiest of conditions to arrive in! Two Grey Plovers on Torness were also new as was an adult male Hen Harrier at the Obs and a 1st winter Little Gull on Troila; other birds of note included single Iceland Gull and Glaucous Gull, a lingering Stonechat, 16 Snow Buntings and 13 Red-throated Divers pushed into Nouster by the strong winds along with Gannets, Kittiwakes, a few Auks and a handful of Long-tailed Ducks. A rough couple of days with blazing westerlies battering the island; there were some new arrivals on the 13th however including a Grey Wagtail at Gretchen, a smart flock of 30 Black-tailed Godwits which pitched down at Brides and a new Woodpigeon joined the two long-staying birds at Holland. The drake Green-winged Teal remained on Gretchen as did the drake Smew on Hooking or Bewan while the single Pink-footed Goose was still with a total of 693 Greylag Geese with other wildfowl counts including 352 Wigeon and 29 Shoveler. Other little bits of note comprised the 2 Glaucous Gulls still and one remaining Stonechat. The 14th was a different kettle of fish with blasting force 8/9 westerly winds in the morning giving way to blasting force 8/9 westerly winds with vicious rain/hail squalls in the afternoon and despite census carrying on as usual a Glaucous Gull, 8 Snow Buntings and 2 Pied Wagtails were the only birds of note. The spring passerine arrivals seem to have stalled after last week’s steady arrivals but a Carrion Crow caused a (very slight) ripple of excitement on the 11th when there were still counts of 182 Skylarks, 2 Stonechats and 8 Snow Buntings but a 1st winter Little Gull was new on Hooking and 4 new Whooper Swans bugled their way around the middle of the island while the drake Smew lingered on. Single Iceland Gull and Glaucous Gull also remained while wader counts included 220 Purple Sandpipers, 200 Turnstone, 197 Oystercatchers and 33 Bar-tailed Godwits with single Hen Harrier and Merlin still causing trouble amongst the flocks. The fog that shrouded the island on the 12th was thankfully thinner at the top end allowing a Sooty Shearwater to be seen passing the seawatch hide late morning – this is only the third spring record and clearly the earliest but with a couple of records on the east coast of the UK in the last week it was probably following the same route made by birds in the autumn - leaving the North Sea by nipping round the top of North Ronaldsay and away…. A contrasting couple of days with a blazing westerly hitting the island throughout the 9th understandably limiting sightings during a tricky census; the Northern Harrier continues to appear all over the place along with 2 ringtail Hen Harriers while the drake Smew was on Hooking. An Iceland Gull and 2 Glaucous Gulls were noted with notable passerine migrants reduced to 4 Stonechats, a Mistle Thrush and 4 Snow Buntings. It was a complete change the following day as first thing it was almost flat calm but overcast with an early morning ringing session at Holland producing 2 Snipe and a Woodpigeon; there wasn’t a big arrival of birds through the day but some real North Ron quality was unearthed highlighted by a drake Goosander lingering on the sea off the NE coast and a Stock Dove in East Loch Park late afternoon – neither of these species are annual on the island, so it had folks running around the place chasing these common British birds while simultaneously barely glancing at the Northern Harrier which kept popping up! (Presumably the same) drake Green-winged Teal reappeared on Gretchen having not been seen since 27th February and was today displaying to the Common Teal while an immature Pomarine Skua passing the seawatch hide was a good record; the drake Smew and 2 Glaucous Gulls were still present and calmer seas produced counts of 15 Red-throated and 13 Great-northern Divers around the coast. There was another good influx of 354 Skylarks including an excellent flock of 200+ in East Loch Park with other notable passerines comprising a littoralis Rock Pipit, 3 Stonechats and 3 Snow Buntings. A couple of blustery days with vicious showers whipping through produced some good early spring arrivals as totals on the 4th included 5 Woodcock, 3 Woodpigeons, 3 Pied Wagtails, 3 Robins, 4 Stonechats, 39 Blackbirds, 3 Fieldfares, a Song Thrush and 4 Redwings. Scarcer birds comprised the Northern Harrier still floating around and 2 Glaucous Gulls including a new, white, brute of a 2nd winter bird. Other little bits and bobs included 3 Pink-footed Geese with the Greylags, an excellent total of 74 Long-tailed Ducks, 7 Red-breasted Mergansers, a Jack Snipe and a good selection of raptors with a ringtail Hen Harrier, the big young female Peregrine and a first winter male Merlin. 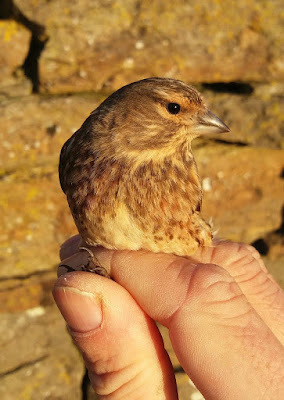 It was even windier on the 8th but sunny through the morning and with organised census now in full swing some good totals were achieved highlighted by the first Mistle Thrush of the year trapped at Holland and the first Dunnock of the year in the north; other migrant totals included 7 Stonechats (equalling the day record set in 2015! ), a Short-eared Owl, 6, Woodcock, 3 Woodpigeons, an excellent 251 Skylarks, 10 Meadow Pipits, 24 Rock Pipits, 6 Pied Wagtails, 10 Robins, 65 Blackbirds, 5 Fieldfares, 2 Song Thrush, 5 Snow Buntings and 7 Reed Buntings. Some good wildfowl counts comprised 843 Greylag Geese, 386 Wigeon, 175 Teal, 14 Pintail, 23 Shoveler, 9 Red-breasted Mergansers and 8 Great-northern Divers while waders were also prominent with 145 Snipe, 190 Redshank and 301 Turnstone standing out. The Northern Harrier was again seen at many points across the island along with 2 ringtail Hen Harriers and 2 Merlins while the 2 Glaucous Gulls were seen again with a good count of 418 Common Gulls. Despite rough, showery weather on the 5th it was clear that there was a little arrival of early spring migrants but the unexpected made the headlines first, with a very brief Red-necked Grebe in Nouster early morning which flew in, landed in the middle of the bay for a couple of minutes before heading off away again round Stromness Point; a real island mega with only c4 previous records! 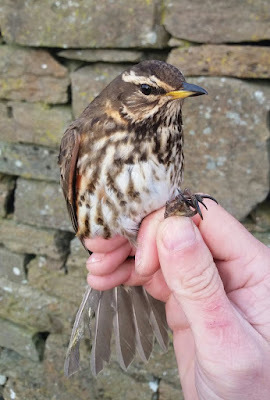 The Black-throated Diver and 6 Red-throated Diver were also off the south end before census up the more sheltered west coast produced 12+ Blackbirds (including one which flew in low across the sea), a Song Thrush and a Robin. 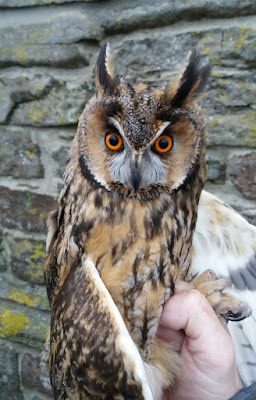 The day’s other highlight came at lunchtime when a fine male Stonechat was trapped in one of the Heligoland traps – the first of the year. Increased coverage and a fairly pleasant morning on the 6th revealed a wider spread of typical early migrants including 4 Woodcock, now 3 Stonechats (yesterday’s male being joined by two females), the first 2 Woodpigeons of the year, 4 Fieldfares, 45 Blackbirds, 5 Robins, a Song Thrush, 17 Rock Pipits, a Snow Bunting and a year’s high count (so far!) of 203 Skylarks with a very decent flock of 150+ at Nether Linney. The Northern Harrier majestically reappeared after a week’s absence having a dogfight with a big female Peregrine (who later killed a Woodcock near the Obs) near Holland while other good birds included an adult Little Gull on Hooking Loch with a big influx of 164+ Black-headed Gulls (many of which back in full breeding plumage and investigating their traditional colonies) and a mobile juvenile Glaucous Gull cruised around. There was no sign of the Northern Harrier through this period so perhaps he has departed for his mysterious summer quarters already; the last entries highlights remained though with the drake Smew still on Bewan and the Black-throated Diver seen in Nouster on most days. Other new birds in the last few days included a 1st winter Little Gull past the seawatch hide on the 2nd, the first Woodcock of the ‘spring’ near the Obs on the 1st (with another on the 4th) and a good group of 11 Common Scoter off The Links on the 4th – always a scarce bird here! White-winged Gull records over this period were more scattered with a 2nd winter Iceland Gull seen on the 1st and the 4th and a single juvenile Glaucous Gull also on the 4th; raptors were also far less obvious than at the end of last month with just a single Hen Harrier seen on the 1st and 2nd. The 6 White-fronted Geese and single Pink-footed Goose remained with the Greylags which peaked at 536 on the 2nd; other wildfowl peak counts included 283 Wigeon and 34 Long-tailed Ducks. The Black-tailed Godwit was still at Ancum while other wader counts of note comprised 265 Golden Plovers, 189 Purple Sandpipers and 61 Bar-tailed Godwits; other waterbirds included 8 Grey Herons and a peak count of 14 Red-throated Divers on the 4th. There was an encouraging whole island count of 669 Black Guillemots counted during the early morning of the 4th with the first birds of the year noted back ashore – we shall repeat the count in a few weeks time but it seems the numbers are present for a good breeding season. Skylarks continued to move north in small numbers during fine weather producing an island count of 129 on the 1st while other notable landbirds comprised 7 Snow Buntings on the 4th, 6 Robins counted during especially nice weather on the 3rd – although these were certainly all wintering birds poking their heads out in the spring-like weather, a male Pied Wagtail on the 1st and a high count of 5 Reed Buntings while in the lovely weather on the 3rd 24 Twite and 30 Wrens were counted, most in full song making the most of the day. At the risk of repeating ourselves the highlights in this period were largely the same with the Northern Harrier floating round throughout, being seen at all corners of the island (getting itchy feet?! ), the drake Smew still and the Black-throated Diver which reappeared in Nouster on 27th and 28th – having said that there were no sightings of the drake Green-winged Teal. Other raptors were more obvious with at least 2 Peregrines seen, one of which, a young male showed many characteristics consistent with one of the Arctic races (probably calidus); 2 Hen Harriers, a ringtail and an immature male were also seen a few times and a Merlin was also zooming around. There was more white-winged Gull action over the last few days with 2 Iceland Gulls seen throughout (a juvenile and a second year) being joined by a third bird on the 26th (although this was probably the bird first seen on the 21st). Up to 3 juvenile Glaucous Gulls were seen on several days, largely staying on the west coast between The Obs and Westness. Actual spring-like migration was predictably still quiet although Skylarks were seen heading north during the fine, sunny (but still extremely cold and windy!) weather of late, peaking at 111 on the island on 27th; also of note was the first Black-tailed Godwit of the year at Ancum; with the exception of wintering birds in the last few years, an unusual February arrival. Some excellent observer coverage over the last few days produced some accurate whole-island counts with Greylag Geese peaking at 897 on the 27th with the flocks still containing 6 White-fronted Geese and a single Pink-footed Goose. Other peak wildfowl counts in the period included 376 Wigeon, 148 Teal, 15 Pintail, 27 Shoveler, 9 Goldeneye and 18 Long-tailed Ducks. Waders were counted in good numbers as well including 330 Golden Plover, 234 Lapwing, 37 Ringed Plover, 152 Oystercatchers, 261 Purple Sandpipers, 3 Knot, 33 Bar-tailed Godwits and a single Jack Snipe seen on several days. Gulls were also well recorded including peaks of 455 Common Gulls and 41 Black-headed Gulls – both species are steadily increasing, seemingly every day – well, it is March now!